The second of 3 consecutive episodes arrives this Sunday, November 13th, 2016, when Fox aired “Havana Wild Weekend“, the 7th episode of Season 28 and the 603rd episode to date. This Episode Fact File will recap the episode with pictures, video clips and more. Get the scoop right after the jump! When the Retirement Castle and the V.A. Hospital can’t solve Grampa‘s health issues, the Simpsons decide to take a family trip to Cuba to get him cheap medical care. 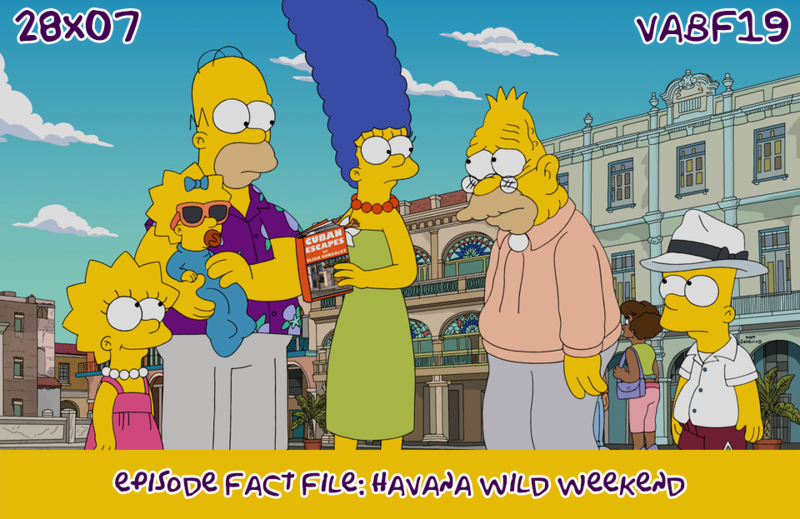 Episode Details: ‘Havana Wild Weekend’ is the 7th episode of Season 28 as well as the 603rd episode of The Simpsons. The episode aired on FOX on November 13th, 2016 and was written by Dan Castellaneta, Deb Lacusta and Peter Tilden and was directed by Bob Anderson. TITLE SCREEN! : A crow flies by and is sucked in the Black Hole with the clouds. COUCH GAG! : The family flies to the couch on top of Mount Olympus but Lisa is missing. She comes out of Homer‘s head and Homer steals Maggie‘s pacifier to close the hole in his head. The Simpsons are watching Vulture’s Nest on TV, when Homer sees a pee stain on the carpet and blames Santa’s Little Helper, but Grampa confesses it’s his fault. The family finds out he’s not healthy and they take him to the Retirement Castle, but all they can do is dump him on Skid Row. Taking him to the V.A. Hospital proves to be more difficult as the appointment is scheduled in 23 years. Another veteran advises them to go to Cuba for cheap health care. The family arrives at Cuba, but at the hospital they can’t do much for him and want to let him die. Grampa loses hope, but he soon finds an old 1958 car, and the owner offers him a ride which rejuvenates him and the whole family starts enjoying Cuba. At the hotel’s bar, Grampa meets Isabella, a waitress who wants to hook up with him later, and an old friend from the Army. He organizes a party on a hijacked plane with other war veterans, making Grampa enjoy Cuba so much that he wants to stay there. Grampa goes to the party on the airplane but Homer, with the help of the U.S. Embassy, tracks him down. Isabella takes Grampa to the cockpit where she reveals she’s a CIA secret agent who is recapturing fugitives from the U.S. back to Miami, and gasses everyone on the plane to sleep. Once in Miami, Grampa and Homer reconcile and go to a golf course with Bart where they scare the players with air horns to make them lose concentration and in consequence fail their strokes. PRODUCTION! 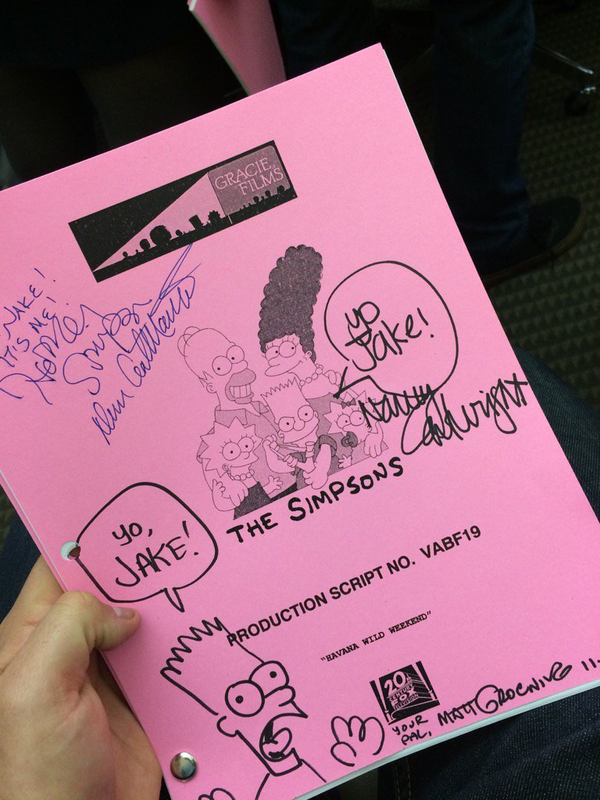 : It’s the 600th episode of The Simpsons in production order and the 603rd in broadcast order. The episode title is a reference to the British movie Having a Wild Weekend. In the couch gag, Homer is dressed as Zeus, Marge as Hera, Maggie as Cupid, Lisa as Athena and Bart as Hermes. Lisa springs from Homer’s forehead, in armor, like Athena was said to have sprung from the brow of Zeus, in armor. Vulture’s Nest is a reference to Shark Tank, which Homer also references when he slips up and refers to the show as Shark Tank. Lisa is reading 50 Shades of ‘A’, a reference to Fifty Shades of Grey. V.A. Hospital is a reference to the Washington DC Veterans Affairs Medical Center. Grampa mentions Justin Trudeau and Hank Aaron. The Che Gue-Ferry is a reference to the Ferry El Che Guevara. I Love Lucy characters Fred Mertz and Ricky Ricardo are seen on the ferry when the Simpsons ride on it to Cuba. One of the legal reasons to visit Cuba is “really love Gloria Estefan“. The book Cuban Escapes by Elian Gonzales is a reference to Elián González‘s custody and immigration controversy involving the governments of Cuba and the United States. Marge and Homer references Mariel Hemingway and her grandfather Ernest Hemingway, and Mindy Kaling. The car Grampa drive in is a 1958 (JOBS) Oldsmobile 88. The song “Chan Chan” by the Cuban group Buena Vista Social Club plays during Grampa’s car ride through the town. The car owner mentions a study made by professor Ellen Langer about aging called “Counterclockwise”, where old people who were exposed to late ’50s culture were more active than the ones who weren’t. The scenes in the hotel with two women smoking and then stuffing their mouth with cigars in front of 2 men is a reference to I Love Lucy. The song sung on Skyhawk Air airplane is Y en eso llego Fidel by Carlos Puebla. The Skyhawk Air logo is similar to that of Pan American World Airways. The song in the credits is “I’ll See You in C-U-B-A” by Irving Berlin. Bart tags his “El Barto” tags in Cuba as “The Bart”. The 1958 car’s license plate is VABF19, the production code of the episode. Grampa plays The Simpsons’ Theme Song on the guitar. In the couch gag, Homer, Marge and Lisa reprise their greek roles from the comic Greek to Me. 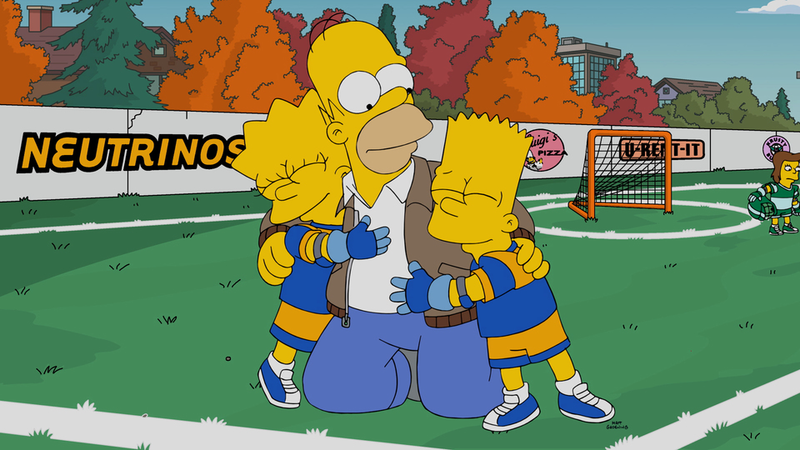 This is the second time that the Simpson family travels to Cuba. The first being in “The Trouble with Trillions“, but only with Homer, Mr. Burns and Smithers. Lisa is reading a book called Homer’s Odyssey, a reference to the episode Homer’s Odyssey and the book Odyssey. 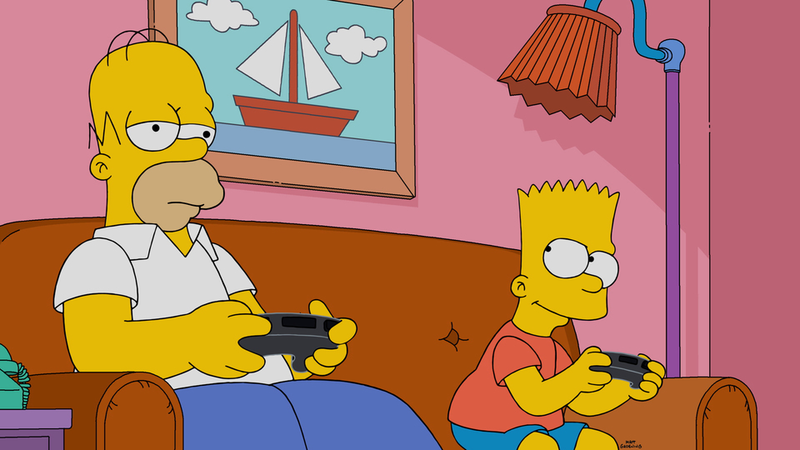 The Black Hole appears in the title screen, and afterwards Homer closes the hole in his head with Maggie‘s pacifier, the same way Maggie closed the Black Hole in Treehouse of Horror XXIII. Homer‘s car disappears when Chief Wiggum leaves Skid Row. When the plane took off, everyone on board (excluding Isabella and Grampa) was standing up or didn’t have a seat belt on, meaning they would be severely injured or even killed. This pictures and videos are from the “Havana Wild Weekend” episode of FOX show The Simpsons. Their use is believed to qualify as fair use under United States copyright law. How much will the monster bundle be? I’m not sure if I should spend 60 donuts on one building or save up for the bundle. Fair enough, thanks for responding! Previous Treehouse of Horror XXVII: Last 24 hours for leaving item in the store!